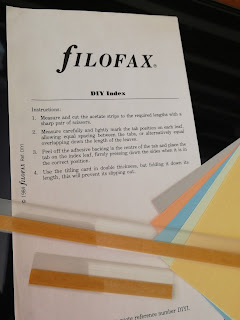 DIY filofax index tabs from the 1980's. I still have some of these! I used to create a training manual for a company back in about 1989 using these. I used to create the labels for them using Rotring technical drawing pens and stencils. I also did the dividers too. The pages where printed out using fan-fold Filofax paper from Portex I still have the software and some paper still!